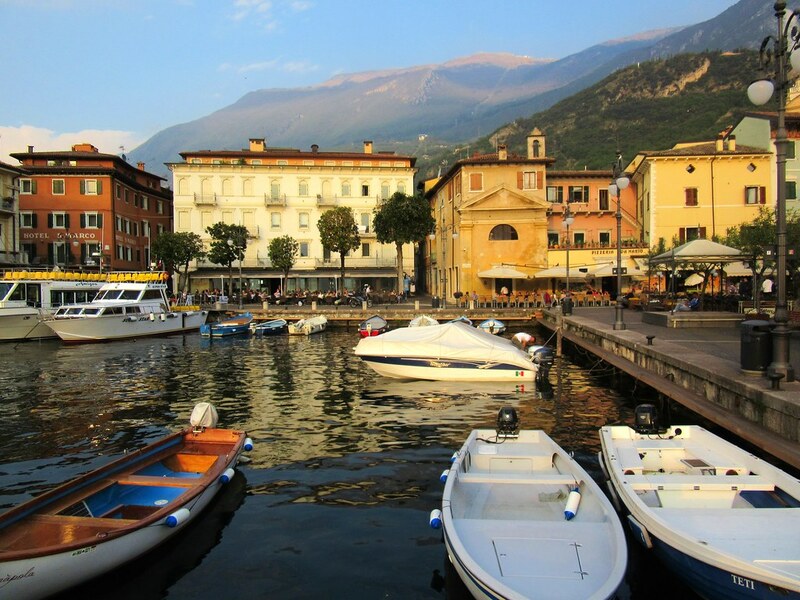 Malcesine was a nice trip down memory lane. We spent our few days there relaxing, eating and drinking by the lake, and reminiscing about times spent there with friends and family. 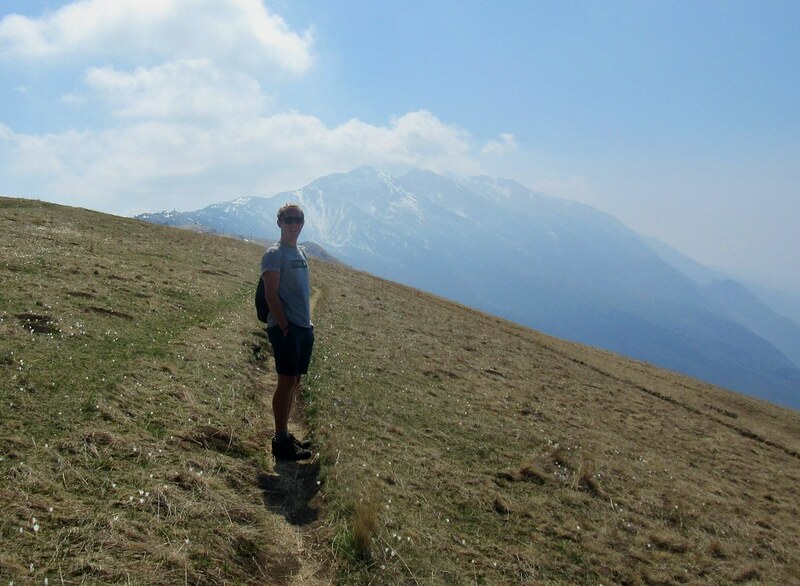 There’s a cable car which runs up from the town to the Monte Baldo ski area, so we went and had a bit of a walk round up there. 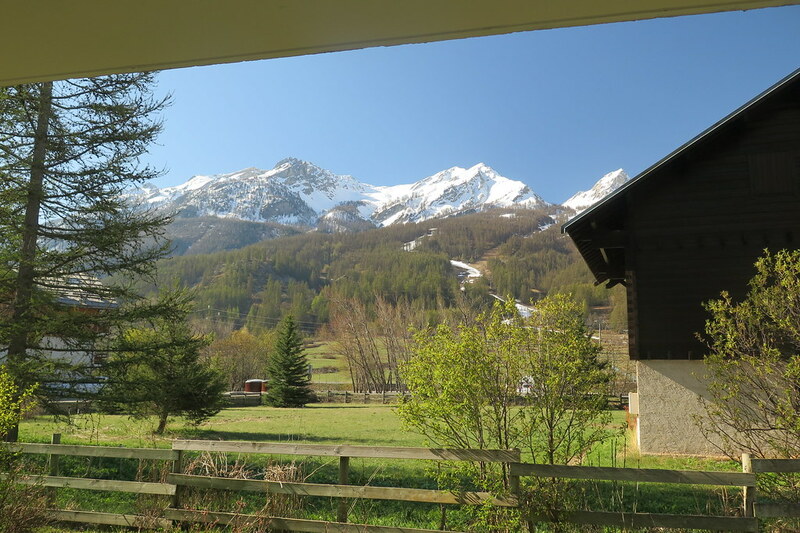 Not much snow left though, so no skiiing for us (…..maybe later). When we left, we retraced our steps down the eastern side of the lake, as the road on the west side is mostly in tunnels. 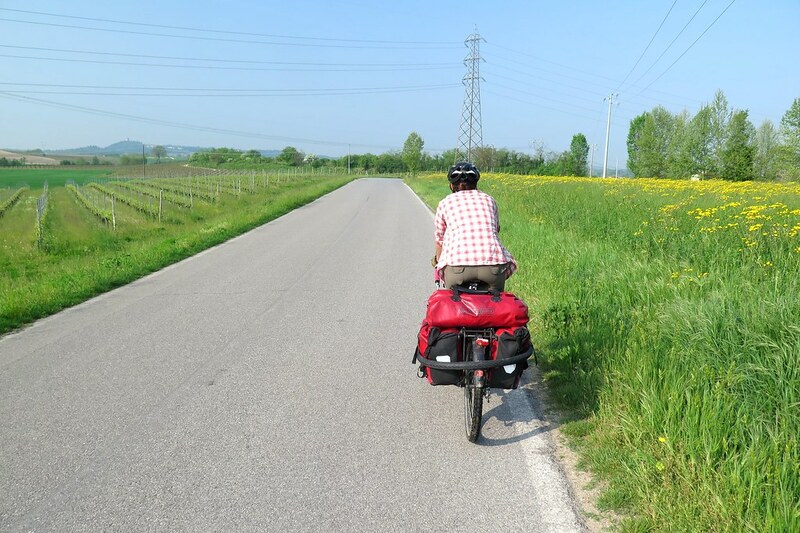 Our first day took us into the countryside just south of Peschiera, where we found a place to camp in woodland. The next few days were, to be honest, kind of boring. I think we’ve been spoilt by the amazing scenery so far in Italy. 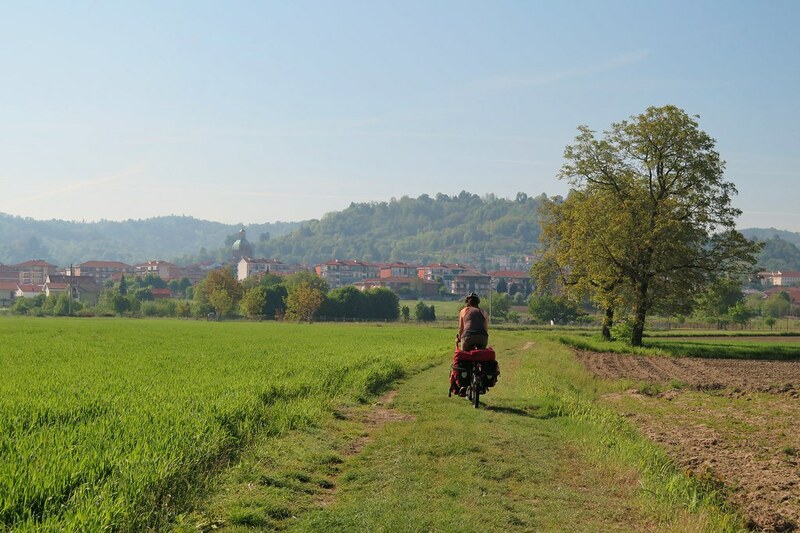 This part was nice enough, but we weren’t particularly blown away by the flat farmland we cycled through, skirting south of Brescia and Milan. 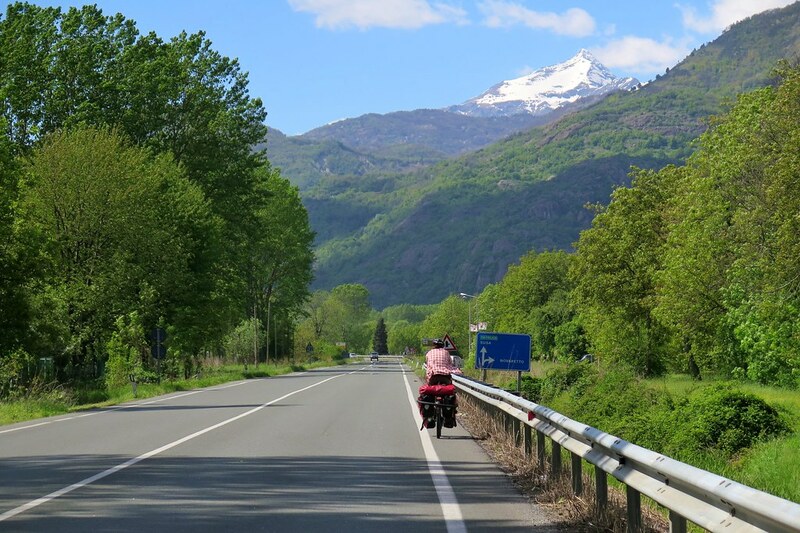 We tried to find quiet roads wherever possible, but more often than not, even the minor roads were quite busy. At least the sun was shining. 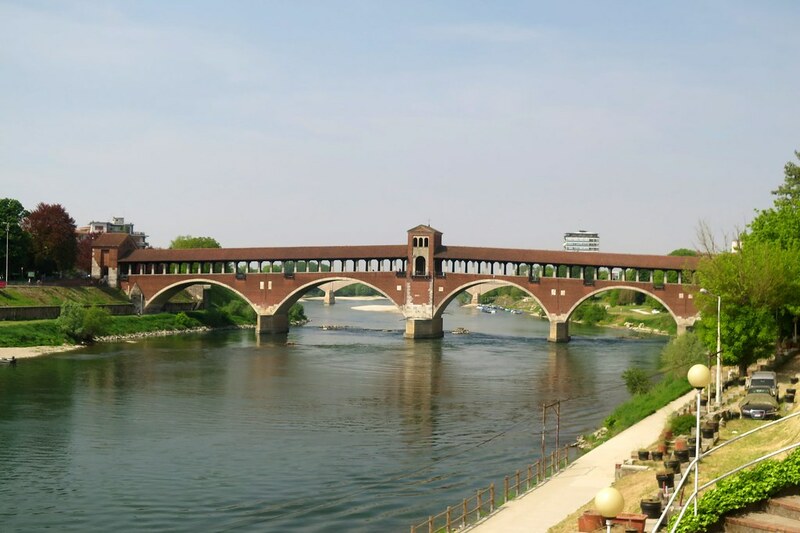 Our route took us through Crema, Lodi and we crossed the river Ticino on an old covered bridge in Pavia. 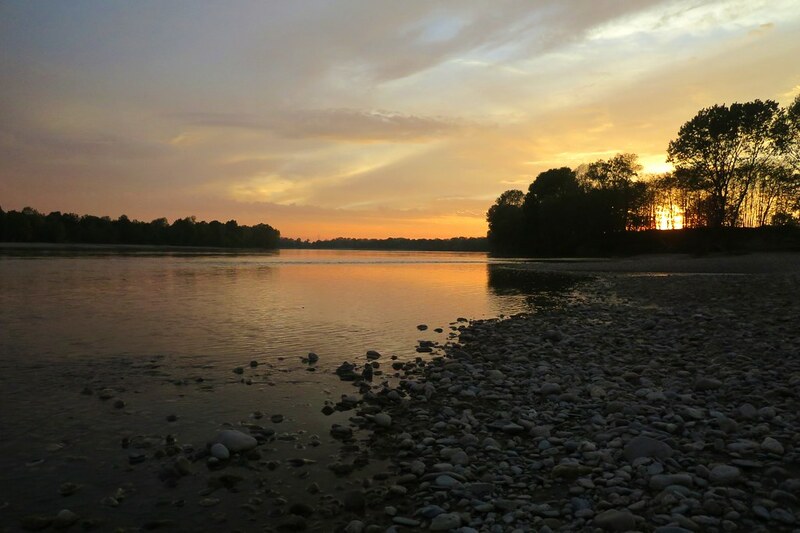 We joined the River Po and cycled along its north bank, which finally took us onto some very quiet roads. 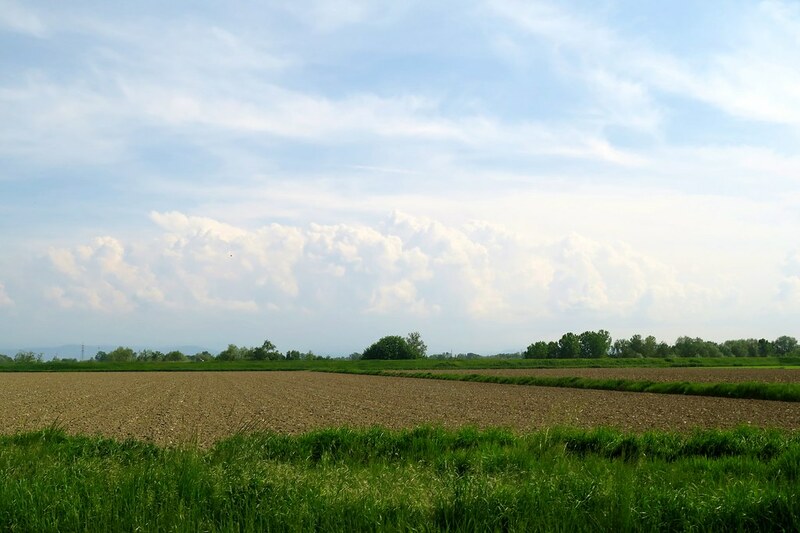 The weather forecast was for storms though, and we could see clouds building up around us. We found a spot to camp next to the river and got the tent up early in the shelter of some trees, incase the weather came in. The wind picked up through the evening and we had a couple of flashes of lightning, but the sky soon started to clear and we got a great sunset. 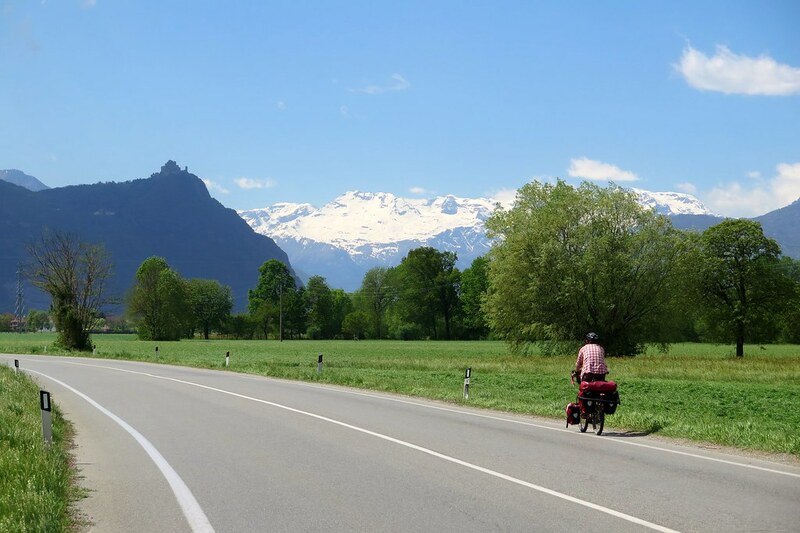 From here, we were getting closer to the Alps, and we started seeing the snowcapped peaks appearing on the horizon. We were into rice growing areas now, with lots of paddy fields beside the roads. Scenes that reminded us of cycling around our home in Central Hokkaido. 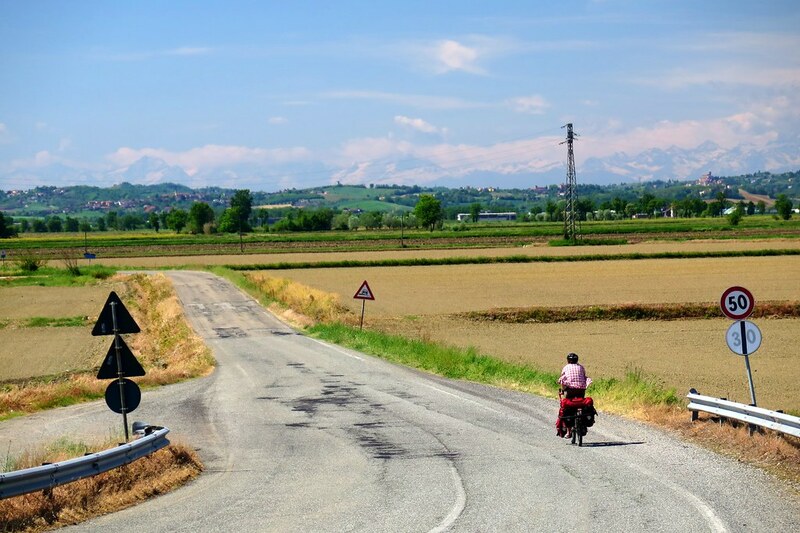 The terrain started to get slightly hillier once we entered Piemonte, with rolling hills and vineyards. That’s more like it! 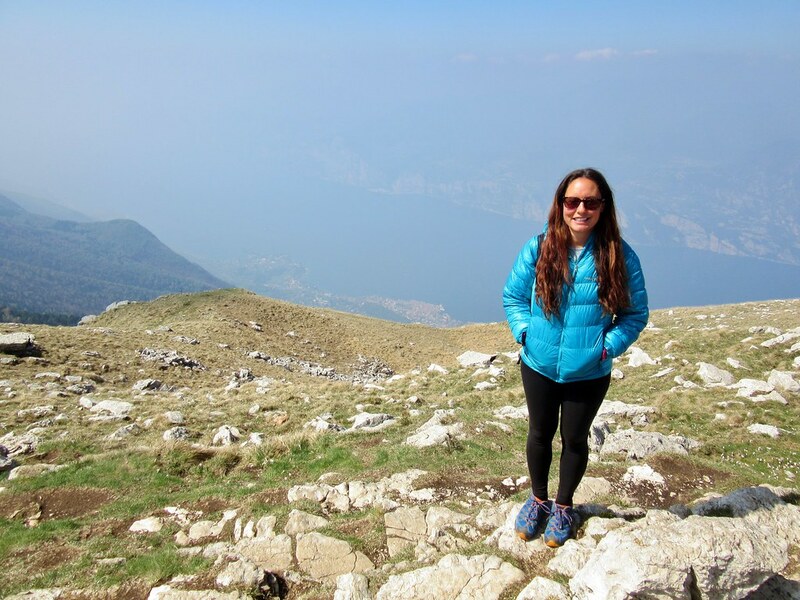 We stayed for one night with a Warmshowers host, Monica, after quite a steep climb up to her home in the village of Terrugia. We camped in her garden and she looked after us really well, even though she had a big party the following day for Easter Monday. She invited us to stay for the barbeque with her friends but, as the saying goes, the mountains are calling. From Terrugia we followed the quieter south bank of the Po towards Turin. Mid-way through the morning, the speedo ticked over 7,000, meaning 21,000km for the trip. A quick photo then back on the road. We wanted to get as close as we could to the city, but not so close that it would make wild camping tricky. It took a bit of exploring, but we found a place just 12km from the centre, setting us up to get through Turin and into the Alps in the morning. 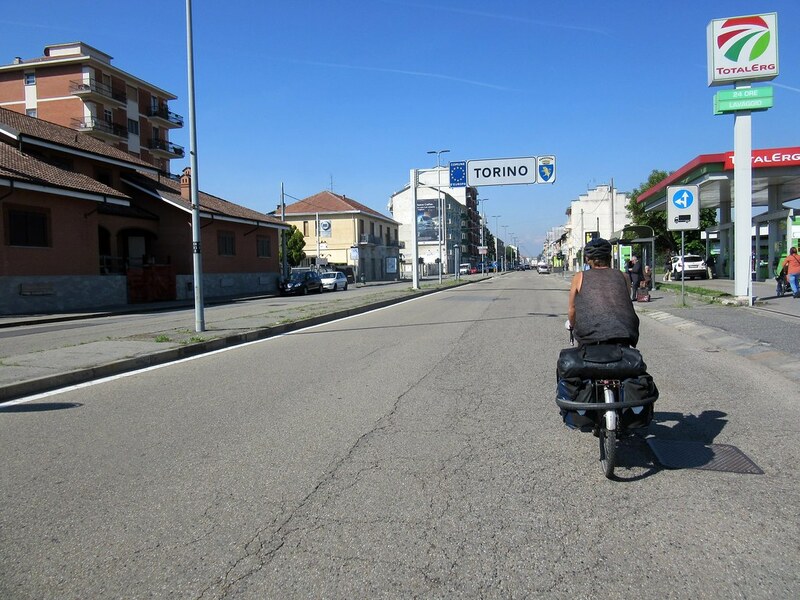 We must’ve been quite lucky with our route, as the roads were wide and fairly quiet in Turin, so riding through it was painless. 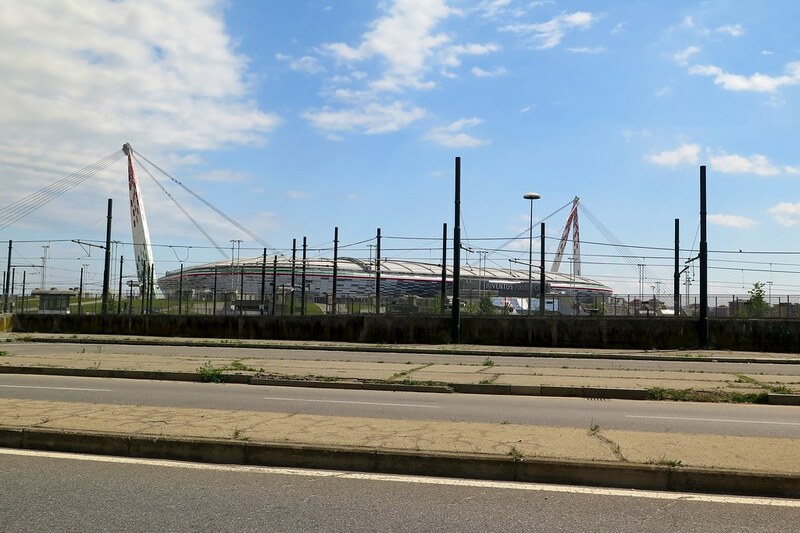 The only hitch was a flat tyre, which delayed us for a while next to the Juventus stadium, scene of Gazza’s tears in the 1990 World Cup. No tears from us though, tube replaced and we were on our way out of the city and into the Val di Susa. I’ve travelled this route into the Alps many times, but only on the motorway or by train. This smaller road was beautiful, climbing slowly through meadows following a river. We were helped for an hour or so by a tailwind, which then changed to a headwind through the afternoon. Time to call it for the day. Finding somewhere to camp here was easy, in a field away from the road with one of the best tent views we’ve had for the whole trip. The next day had some tougher climbs. The motorway and trainline goes through many tunnels as it climbs the valley, so I hadn’t realised quite how steep some parts of this road would be. The headwind didn’t help either, but the views did. The deeper into the valley we rode, the mountains around got taller and more spectacular. 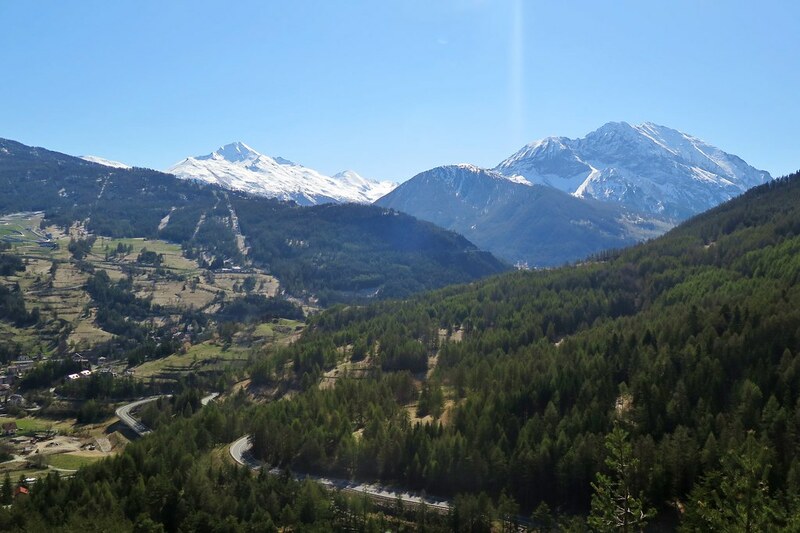 We’ve seen some incredible mountains on our bikes, but I’d forgotten quite how stunning the Alps can be. It’s easy to overlook what’s on your doorstep. Like the previous day, the wind picked up through the afternoon, and clouds started building along the ridge lines. By this point we’d reached Oulx at just over 1,000 metres and the road was only going up from there. We decided to stop for the day and tackle the pass in the morning. It was a good thing that we stopped where we did, as within an hour of putting the tent up, snow started falling! It was a cold night and we were glad not to be higher. 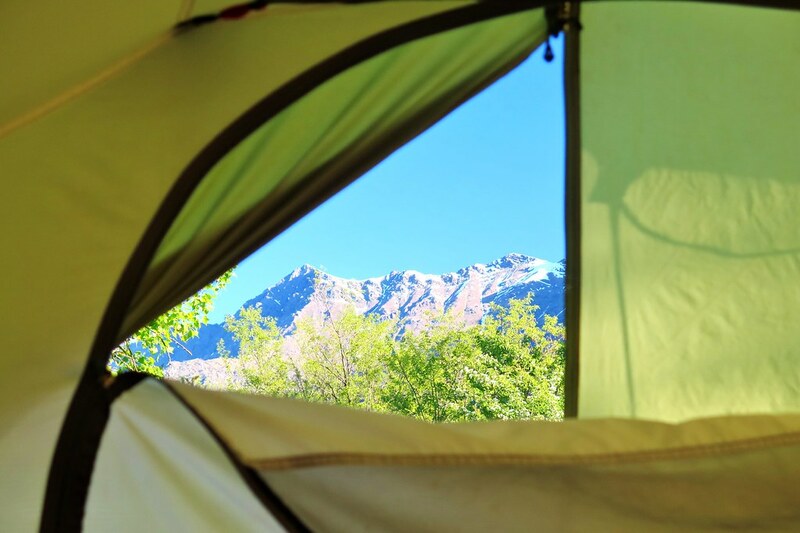 It was an effort getting out the tent in the morning, even though the sky was clear and blue. We were tucked down next to the river and in the shade, the temperature was -2 inside the tent at 7 o’clock. Luckily as we finished packing up, the sun hit us and we took a few minutes basking in the sunshine to warm ourselves up. 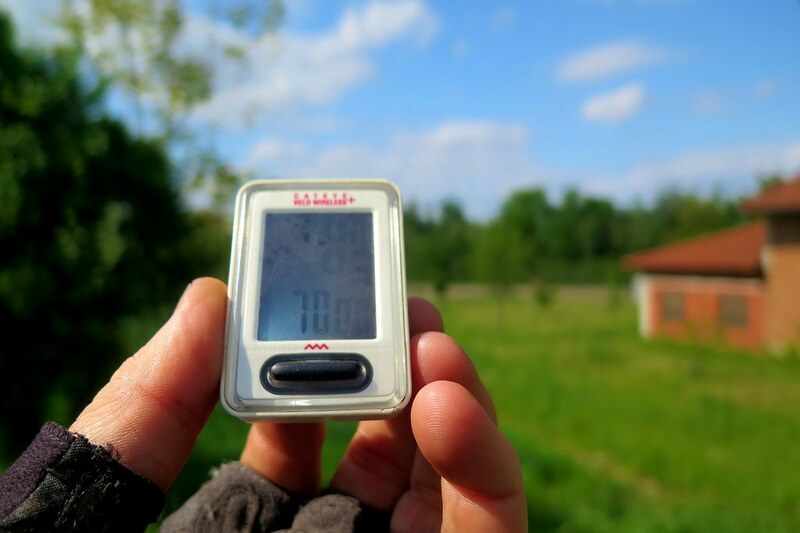 We were back into the shade on the road though, and cycling hard to keep warm up until Cesana where the sun hit us again. 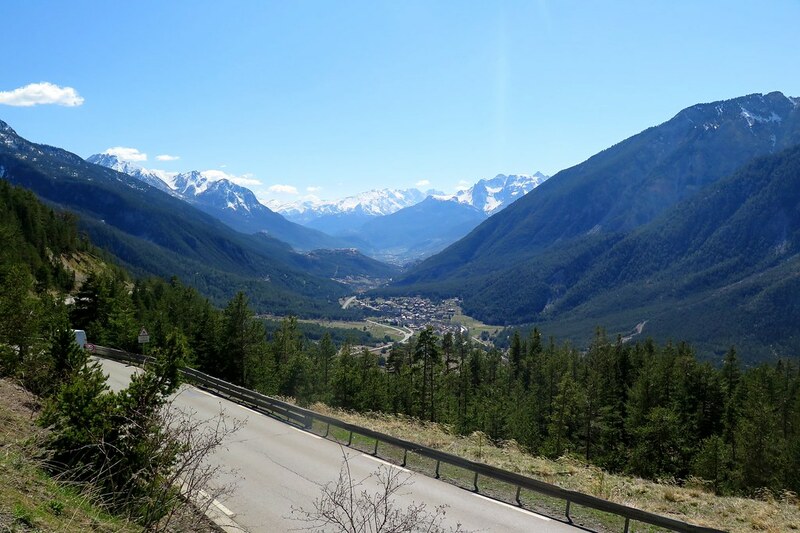 From Cesana, the final climb started, round a few switchbacks gaining altitude quickly. We lost the extra layers and thick gloves for an hour or so grinding away up towards the col. After a long tunnel we emerged in Claviere, the last village in Italy. At the top end of town we passed the old deserted checkpoint from when they used to check passports at this border. 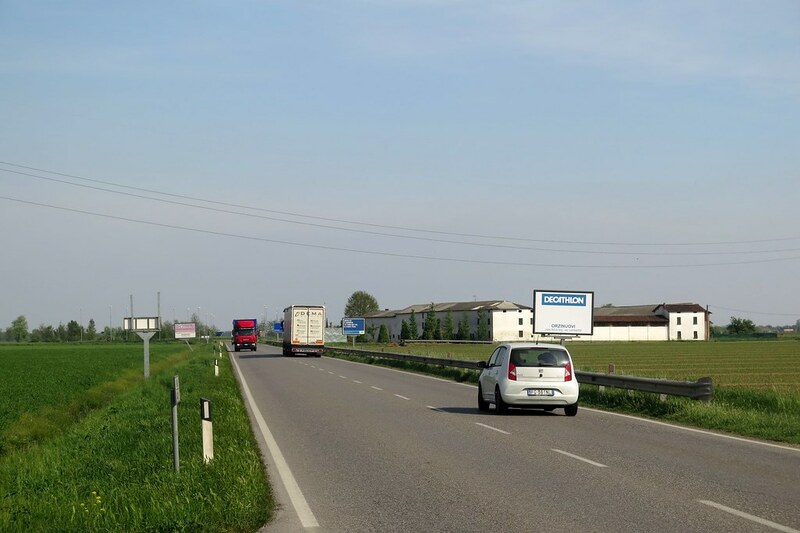 Then we passed the blue European sign showing that we were crossing into France, country number 19. 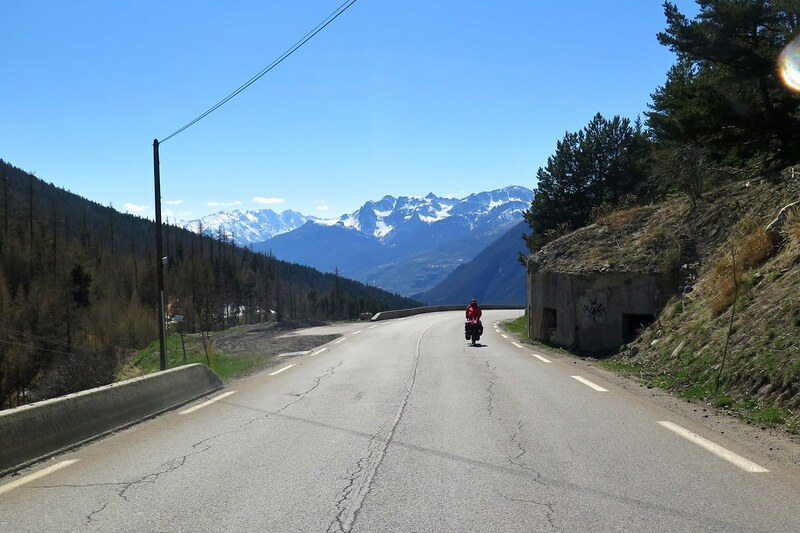 A few more corners and we were riding into Montgenevre, the top of the pass at 1,850m. Legend has it Hannibal crossed the Alps here with his elephants. 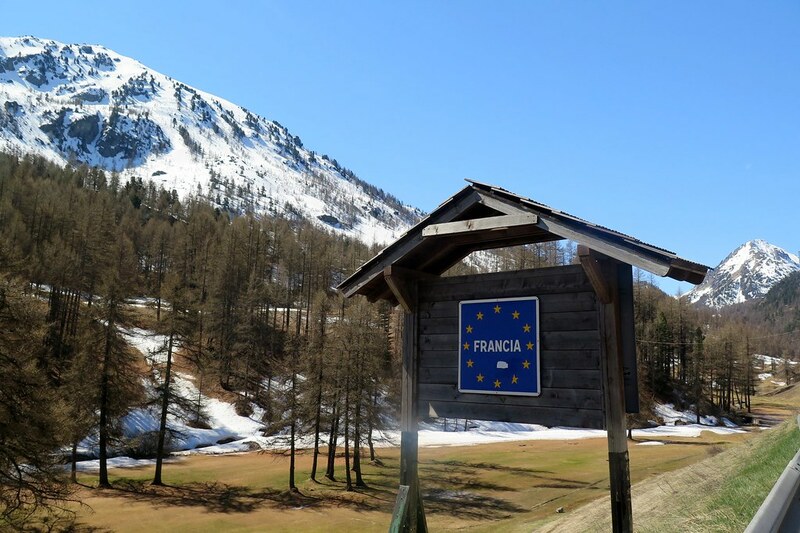 Also in ancient history, I worked a couple of ski seasons here in the early 2000s, washing dishes and chalet hosting in return for a season pass, somewhere to sleep and a bit of beer money. It was a nice moment arriving there, and the last real pass we’ll be crossing on the bikes. A nice moment became even sweeter when I saw that the chairlifts were still running and that there were skiers on the hill. I’d kind of assumed the season would’ve finished by now. I think Clare knew what I was thinking even before I suggested it – how could we miss this opportunity for a few hours skiing? 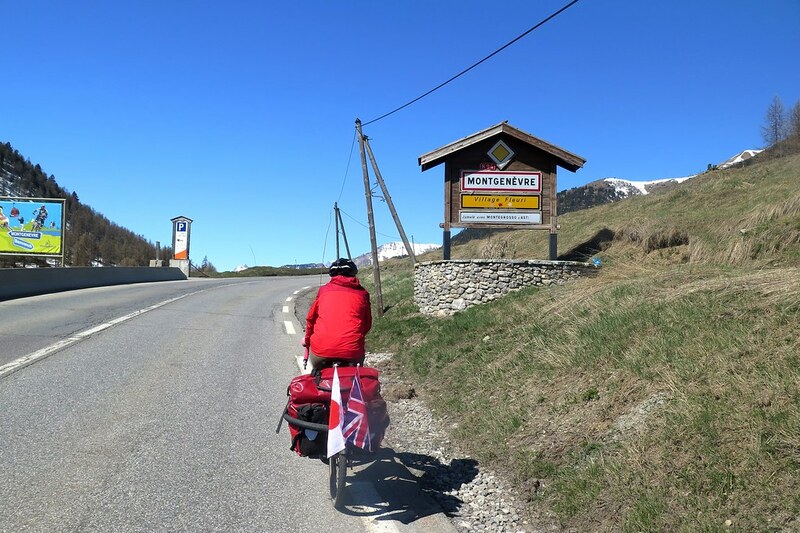 Thanks to an old seasonaire friend who’s still based in Montgenevre, we were able to store our bikes and panniers, then we sorted out some rental gear and hit the slopes! The snow wasn’t the powder we’re used to, Hokkaido has definitely spoilt us, but the sun was shining and the views were fantastic. I couldn’t wipe the smile from my face, what an awesome day – cycling a big pass and going skiing on the same day. We might have been a bit rusty after two years without skiing at all, but it soon came back. 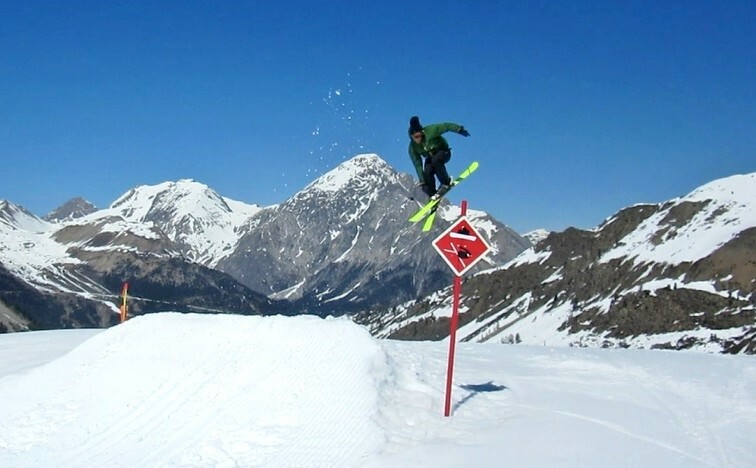 We even hit a few jumps in the park, we’ve still got it. The legs started to get a bit tired so we headed back to the village, conscious that we still had a bit of cycling to do. We returned our skis and got our bikes back from Craig at Le Graal, thanks very much to him. 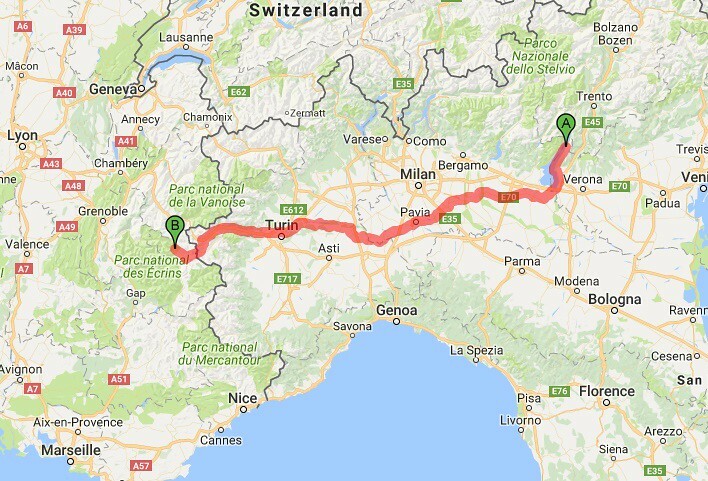 (He’s just started a new cycling business, offering tours and routes on some of the classic Alpine passes. So if you’re a roadie, keen on bagging some Strava records, check out www.chainlynx.co.uk) From the Col de Montgenevre we had a long, winding desent to Briancon. Luckily we’d left some of our ski layers on, as it was very chilly riding downhill for half an hour. So much fun though! 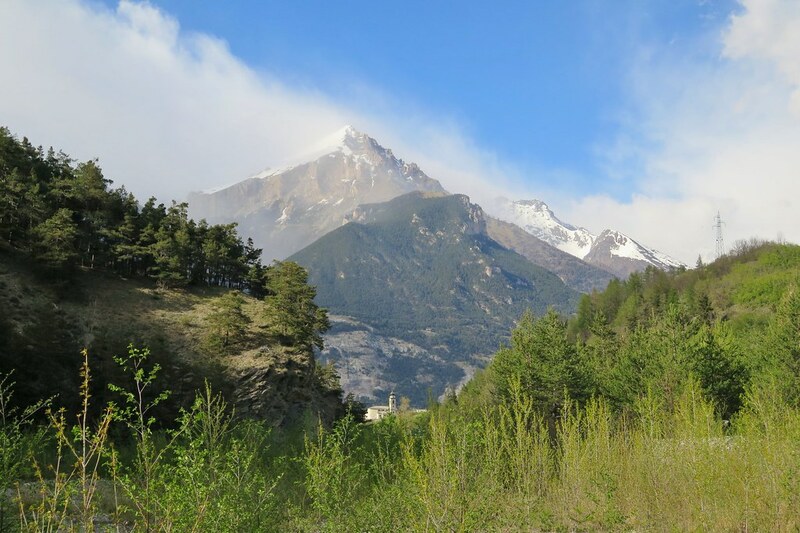 At Briancon, we hooked a right to head up the Serre Chevalier valley to Monetier les Bains. Reader of the month award (sod it, let’s make it reader of the year) goes to the lovely Helen Beaumont. I post a few pictures and updates from our trip on a ski website and we asked on there if anyone in the valley might be able to give us some tent space for a night. Helen replied saying her apartment in Monetier was empty this week and that we’d be welcome to stay. Amazing. So we’re having a rest day here in a nice warm apartment with a comfy bed, warm shower and an incredible view from the terrace. Thank you so much Helen, you’re an absolute star and I hope one day we can repay the favour! 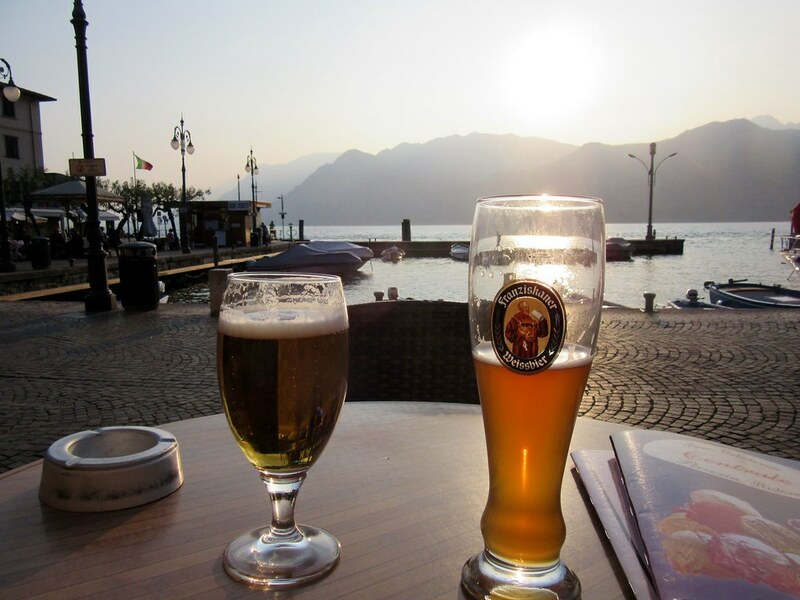 What a delightful post with places we know and love..well ok Diarmuid knows Malcesine and the mountains above but Turin Claviere and Montgenevre are old favourites of mine..Turin sadly for skiing injuries! 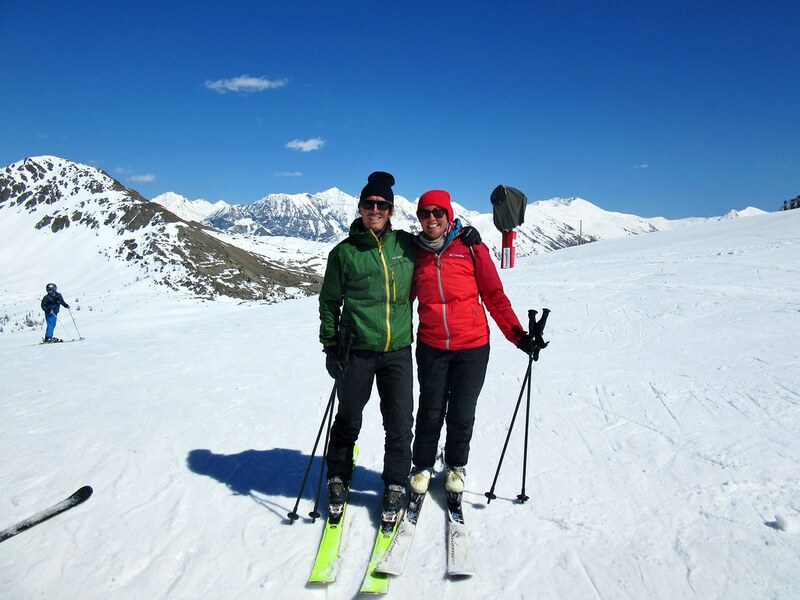 I skied Montgenevre and Claviere again a couple of years ago with Heather and had such fun. I spent time in the Pyrenees before uni and love Carcasonne..you will too. Off on a bike ride this afternoon in the low but lovely New Forest. 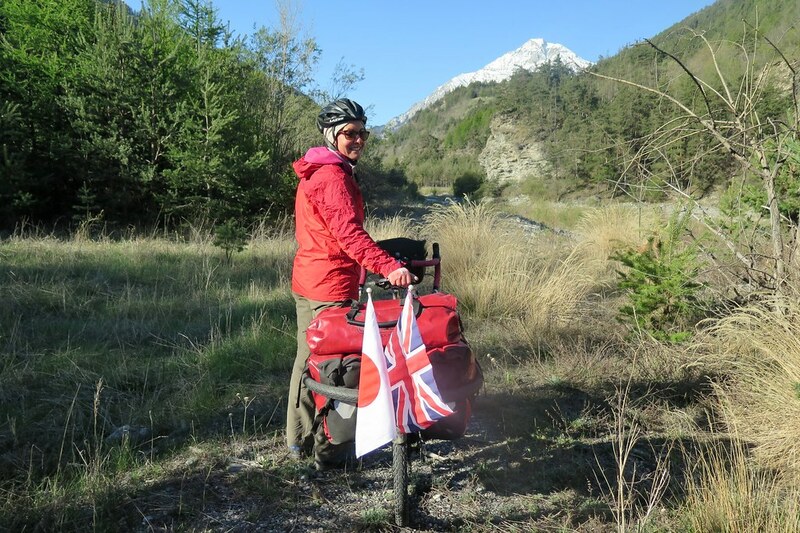 Your blog keeps making me want to pack a couple of panniers and head off! Thanks Tess. It’s nice to be in familiar parts of the world, especially in places that we’ve such great times in the past. Hope you’re looking forward to your London to Brighton ride. 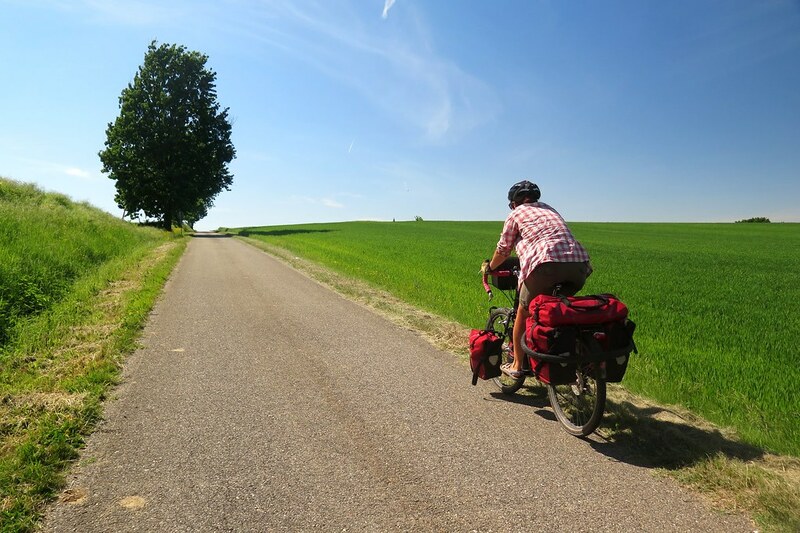 And as for packing a couple of panniers and hitting the road, my only advice would be…… do it! !